Itâ€™s magical the way sewing plus embroidery turns something ordinary into something extraordinary. 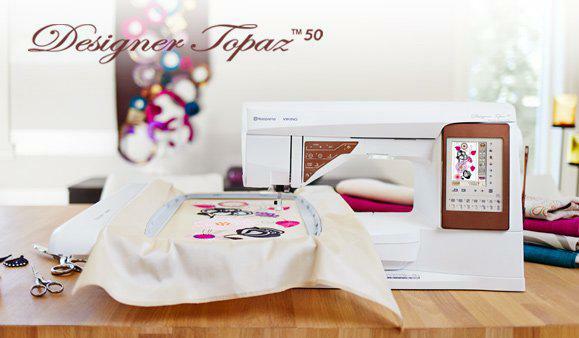 With the DESIGNER TOPAZâ„¢ 50 sewing and embroidery machine you also get the advantage of built-in assistance and time-savers to help you bring your ideas to life. Push your creativity to a completely new level. Expect fabulous sewing and remarkable embroidery! Internet updates ensure that your DESIGNER TOPAZâ„¢ 50 sewing and embroidery machine is always up-to-date. Our unique EXCLUSIVE SENSOR SYSTEMâ„¢ technology senses your fabric thickness for perfect, even feeding. The Exclusive SEWING ADVISORÂ® feature optimizes your sewing by selecting the best settings for you and giving you on-screen advice. Hoop clips (16), 6 Bobbins (1 in machine at delivery), PICTOGRAMâ„¢ Pen, USB embroidery stick (1 GB), Software to download, Carrying Case (attached on the machine upon delivery), Scissors, Foot control, Power cord, Needles, Embroidery thread, Pieces of fabric and stabilizer, DESIGNER TOPAZâ„¢ 50 Sampler book, Warranty card, Microfiber cloth.